Yes, I know…. Easter is only one day a year so “let kids be kids!” Well, guess what? I think kids can still be kids with sidewalk chalk and new games and bubbles and water balloons and craft supplies and even their very own gardening tools! There are way too many holidays and “special” occasions centered around junk food these days (which, frankly, isn’t so great for our kids’ health). So how about shifting the focus when you’re the one in control? Here are some fun candy-free Easter ideas that your kid will love plus what we do for our own kids on Easter morning every year – in both news clip and text form (just below). FYI – There is an Easter Bunny spoiler alert in the video so don’t watch it with your kids! I love to give items that I would probably buy them anyway! What are your candy-free ideas for Easter? I’d love to hear them in the comments! Those are all fabulous ideas. I do some of the things you listed and I only put a small amount of candy, usually only chocolate, in my kids baskets. However, with three kids your ideas really add up cost wise. I can’t spend $25 or more per basket. What do you typically spend on a basket? Carrie – The summer basket is almost exactly what my daughters will get. 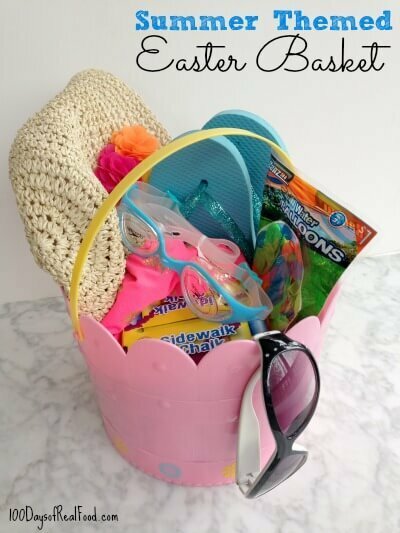 We actually already had the bucket (from last year – saved with our Easter stuff)…I think the sidewalk chalk was $1, the water balloons less than a $1, the goggles were and flip flops were a few dollars, and the bathing suit (from Target) was $12, I believe? So it really isn’t too pricey! When my kids were little we put baby carrots in the plastic eggs. After all, that’s what the Easter Bunny would eat! This year for our Easter egg hunt I got organic jelly beans, Annie’s bunny grahams and stickers! 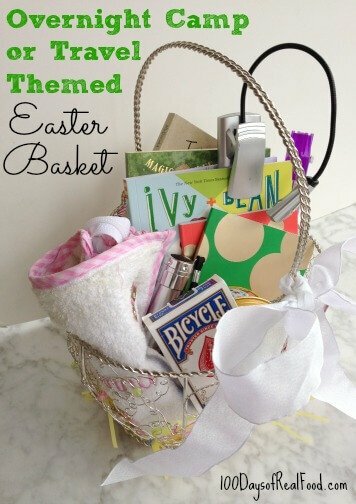 Of course we always hide a golden egg filled with coins :) thanks for sharing all the great basket ideas!! Awesome ideas!! I’m going to have to share this with my family and friends for sure, we all need to stop focusing on food every time there is an occasion! Great ideas! I have a 2 year old and you listed many things she would love to find in her basket or egg. Thank you so much for the great tips! Great ideas, thanks for the inspiration! With the weather getting better here in NYC, I’m going to make a sand toys Easter basket w shovels, rakes, buckets, a dump truck for my son, and different molds for my daughter to make shapes with. Will probably fill nooks and crannies w bubbles, sidewalk chalk, and some healthy snacks like those organic bunnies! We are doing a Lego kit for each child in coordinating colored eggs blue for one child and green for the other. Also Annie’s bunny grahams. In the baskets they usually get a new spring/summer outfit. This year our 2.5yo daughter is getting sandals, a coloring book, crayons, markers, a kick ball and a few bags of Annie’s bunny grahams or fruit snack packs. One year, when I didn’t have very much money for Easter baskets, I created a new tradition. The kids brainstormed privileges (i.e. staying up 30 minutes past bedtime; helping to make dog treats; 1:1 time with mom). The privileges are put on paper strips and put inside those plastic eggs. I hide the eggs inside (for lousy weather) or outside. Once all the eggs are found, they make sure they both have an even number of eggs. The best part is when they finally get to open the eggs and see which privileges they will get! There is some trading that happens, but it’s lots of fun for everyone. Five years later, the kids are 12 and 9 and they still ask for this tradition to be continued! Lisa – what a great video clip and wonderful ideas!!! We already use many of these and they go over extremely well for our girls. Also, thanks so much for bringing the real food lifestyle into the public viewing audience. As a mother who has strived to feed everyone in our household real food for close to four years now, it is still often hard for others to really “get” why I feel so strongly about this topic. Most of my friends/family don’t really “get” the deep down technical reasons why we don’t eat out, won’t eat fluorescent pink cupcakes, and why I am always the “difficult” one when we go out to eat because I have to research the menu/ingredients beforehand. Thanks for making me feel like there are other people out there with the same real food guidelines! This year my girls are getting rainbow/spring themed baskets. Each girl gets 2 Easter/color/spring themed books, a colorful My Little Pony and a colorful/springy stuffed bird. In addition, my oldest is getting a prism, my middle girls is getting a kalidoscope and the youngest finally gets her rainbow umbrella (3 year old gift). I picked up the books, ponies and beanie babies last spring while garage sailing and got the other toys when my favorite independent toy store was having their annual 20% off sale. UNFORTUNATELY, my girls will be getting their fair share of candy from my dad, his girlfriend and my in-laws. I wish I could get my family to understand that my kids want their time, not treats. Or at the very least, to limit the treats! I love the idea of things you would buy anyway! And so much of this can come from the dollar aisle or dollar store so there’s no need to spend too much. I usually put a small amount of candy, too, but with fun things like stickers and chalk, they don’t notice that they only got a couple pieces. I like the little foil wrapped Lindt chocolates that are shaped like bugs, or the bags of orange jelly beans that look like carrots, because they make an impact in the basket but don’t add up to a lot of candy. My son is only 20 mo. old & I worry about so much of the Easter candies/treats being choking hazards. This year he is getting musical instruments. I have gotten some maracas, a tambourine & some of those shaker egg things. I think I will scout out for some of those bunny shaped graham crackers & call it good! Thanks for the idea of a non-sugar laden basket! I have 4 grandchildren and I am the one who makes up the easter basket and puts on the egg hunt. Again candy is limited and more toys. I like the sumer basket idea. Anyways I usually put change into the plastic easter eggs. The kids enjoy the money and depending on their parent, they get to spend it or save it for something special. Lisa – great post. We are in Florida and I would love to get the bread bunny. I went to the HBC (store) website but can’t find any that have the product. Where can I find it and will they ship to Florida? thanks. Last year, we did new backpacks for the kids to put their gifts in. We like doing summer clothes (shorts & a shirt) and/or a board book that’s church related or on Christ. Love the ideas to put in the eggs. My daughter’s birthday is the day before Easter this year so we’re doing an egg hunt, and I had trouble of thinking of ideas to put in the eggs. My oldest just turned 4 and due to his birthdate he didn’t have his 1st Easter until after his 1st birthday. I have never focused on candy with my children for any occasion. And why should I give candy when we still have leftovers from Halloween?!? I also agree that the gifts they receive can be items you planned to give them anyways, I actually have a hard time just buying them stuff and prefer to gift it. I bought a majority of their Easter items marked down at Michaels’ last summer (75% off!) and have saved it. They will be getting new fold up lawn chairs, a frisbee, bubbles, a parachute, and a few other small things. Since we have decided to camp on Easter weekend, the Easter Bunny will make his arrival 2 days early so they can use the items at the campground. I did purchase some caramel filled Easter bunnies (fundraiser) so the Easter Bunny will bring those to the campground! I don’t understand why kids even need to get anything like this at all for Easter? Why an Easter “gift”? We’re not religious so we don’t acknowledge it from that aspect, but why does it need to involve something completely unrelated to any traditional Easter-ness? If you feel the need to do anything to mark the occasion, what about just making whole food hot cross buns on Easter Sunday for breakfast? Or if a basket needs to be involved, give an empty one to the kids to have an egg hunt in the garden, gathering hard boiled eggs they can then decorate the shell of later? Whilst wearing bunny ears they make themselves or something if you really need to mark the occasion. I just really don’t see the point of baskets filled with random unrelated stuff just for the hell of it. I wholeheartedly agree with”NO MORE STUFF!” My sister sends my kids “stuff” for Halloween, Thanksgiving, Christmas, Valentines, Easter etc. etc. – Oh, just ‘little’ things….stickers, crayons, sunglasses, tops, car games etc. etc. But we have a million of these things and I spend my days picking them up off the floor and throwing them away. If my kids DON’T get something, they don’t notice and I breathe a sigh of relief. They would be thrilled dyeing eggs and hunting for them with the same baskets they received for their first ‘mobile’ Easter; making deviled eggs, having a fun breakfast and a visit from Grandpa. ’nuff! We do candy on Easter, but not a large amount and I only get natural, dye-free stuff. It’s not perfect, but I’m okay with it. We never, ever buy candy any other time of year, so my daughter gets ultra-excited about that candy on Easter. But it takes her a really long time to eat even the small amount we give. We put it in a bowl in the cupboard and eventually she forgets about it. So her dad eats it up. :) My youngest is 2 so he doesn’t know much about candy yet. Thanks for the ideas. We’re hosting my inlaws over Easter, and their son has Type 1 diabetes, so I’m especially trying to stay away from the candy. Love the ideas. I don’t give any candy in my son’s or his cousins easter baskets. They get SO MUCH from their grandparents, it’s ridiculous to add onto it. I give them: bubbles, chalk, kite, sticky hands, play dough and those organic veggie pouches from the baby aisle-surprisingly, they always gulp those first. Actually, nothing even fits in the easter eggs at all. haha! This year my kids’ chocolate treats (chocolate eggs, chocolate covered pretzels) are going to be all made with real food – no refined sugar, preservatives, etc. 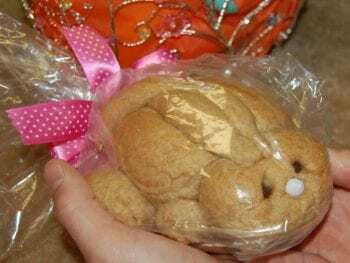 I’m also making some cute little meringue bunny cookies (made with honey), and Annie’s organic bunny crackers are always fun when you put them in a “carrot” (cone) shaped plastic bag! You inspired our “junk free journey” and I posted our Healthy Easter Treat plan on my blog (www.junkfreejourney.com). Thanks for all your great ideas! I have teens that still like to do a basket and egg hunt! This year I have new spring/summer pajamas, card games (yep, they play them with their “cool” high school friends when they come over), hair ties, for my electronic-minded son, new ear buds, music gift card and a retro CD he’ll love! For snacks we do WW or whole grain snacks and I dried our own apples into chips last fall. They appear periodically packaged in a fun way. I have “carrot” bags for this season! For eggs to hunt I have added matchbox size cars, hair ties or clips, ChapStick, nail polish, Legos like was suggested. Think outside the candy box. I am a dental hygienist! I always put CARROTS in the kids’ Easter baskets because bunnies love carrots! Also, I put stickers and little prizes in their Easter eggs before we hide them. OMG!! Thank you so much. I’ve been trying to decide on what to give the kids at the end of their “trivia egg hunt” – other than candy. Thank you SO much for the great ideas!! Just a quick note, Lisa…to say how wonderful you, your blog, and the work you do are. Your creative approach to food (especially for kids) is so appreciated and much needed. A paradigm shift is underway…and you are helping make it happen. Thank you!! I was just having a conversation with my mom the other day about gifts for my niece (3) & nephew (1) that are not food related. I got them some books and play-doh and my mom is giving them bubble stuff. My SIL is very big on acknowladging where the gifts come from, so everytime I give them books or something like that I put my name and the date in there something like ‘to AH from Aunt Caroline April 2014. That way when she is older she will have the books to remember special times with me and maybe they would even get passed on to her kids. As a kid we got some candy but not a lot – usually a chocolate bunny and a handful or two of m&m’s or jelly beans. My mom always put coins in the plastic eggs that we would then hunt for. Now that we are grown we still have egg hunts but now the eggs are filled with singles, and there is one ‘golden egg’ that has a $50 in it. Great ideas! I’ve always limited candy and will keep doing so, but love the spring outdoor themed things especially. We fill up clear, cone shaped bags with goldfish (you could use Annie’s cheddar bunnies) and tie the top with green ribbon. It’s a healthier alternative to orange Reese’s Pieces or orange jelly beans and our kids love that they get a fun carrot shaped snack in their Easter basket! We talk a lot with our son(9) about Easter being (for us) a religious holiday and not a major gift giving day. He has a small basket which will have a new toothbrush that plays one of his favorite songs( he saw it at the drugstore recently and went nuts so I went back without him and got it), a very small lego set, a small stuffed rabbit and one small chocolate rabbit. For the egg hunt we put coins in plastic eggs. Years ago when we used to put candy in the eggs he never ended up eating it so we switched to money. He loves money!!! This is exactly what I’ve been doing for my 3! This year i decided to add Annie fruit bunny snacks. These are a rare treat as they are on the pricier side and the kids LOVE them. I also decided to give my girls the Frozen dolls since they absolutely love Frozen (we watch the movie everyday) and they really only get toys with their allowance or holidays. I think getting bubbles, crayons, side walk chalk, and art supplies is so much more fun than candy! The idea of an ‘Easter basket’ filled with chocolate, sweets or toys boggles my mind. I’ve never heard of this being done in Australia, and until this Easter I never even saw the plastic eggs that split apart. We always got one chocolate egg after church from the Easter bunny and three or four really small eggs each from the hunt and that was it. We dyed boiled eggs and had hot cross buns and it was all over. I’m glad that the plastic eggs are here, it means that we can do the hunt with non chocolate eggs this year! So only one dark chocolate egg for everyone from the bunny and then lots of small (mostly non-edible) goodies in the plastic eggs for the hunt. Easter is not about gifts, it is about new-life and rebirth, and the Easter bunny is most certainly not Father Christmas. It must be a nationality thing Isabel because my mind boggles too! I commented further up pondering why everyone gives gifts but no one responded, I guess it must be the norm over there, I’m glad it’s not here! Our Easter Bunny has always brought fruit – fresh strawberries, melon, kiwi, pineapple, etc., and sometimes a new fruit like a star fruit or ugli fruit. Carrots with tops are a must. The kids get some in their baskets, which are hidden, and some is in a big display on the table. Along with colored eggs, they think it’s a feast! Family Easter egg hunt I put bunny money in the plastic eggs,then I set up a bunny store so they can spend there money. Some things will cost 1bunny money up to 5 bunny money.THEY LOVED IT!,! Thanks for the great ideas for fun alternative Easter Egg Hunt treasures! In my experience, the fun really is in the hunt itself! My hubby gives our family’s Easter Egg Hunt a SUPER BOOST OF FUN by creating rhyming riddles for clues leading the kids to their Easter morning treasures. They’re a time-saving, fun-boosting, laugh-out-loud collection of clues from Simply Fun Families. My kids LOVE the scavenger hunts too. They are 9 and 12, and ask me to do one every year. I am going to check out the website you gave for cllue ideas. Thank you. We didn’t do candy when I was a kid…my mom made decorated “eggs” from the craft store and we used them over and over for many years. We had some hard boiled eggs that the kids decorated. We had an egg hunt after church, and the traditional dinner. I think decorating and hunting Easter eggs is fun for the kids. The “Easter basket” and “Easter candy” is just so retailers can sell more stuff. I am putting freeze dried fruit in some of the eggs. It has the texture of the marshmallows in lucky charms cereal and all it is is fruit. We are expected to provide gift baskets for extended family with four boys ages 9 – 12. These lists are great for younger kids, but these boys no longer play with sidewalk chalk and bobbles. Any suggestions for this age group? So many great ideas! I love the baking and summer themes. We are doing some jazzed up gardening themed Easter baskets this year! Great ideas! Our kids are 2 & 5, and will be getting character band aids, fun flavors of toothpaste, new toothbrushes, sidewalk chalk, coloring books, sunglasses, Annie’s bunny crackers, and one small treat each. Out grandma ordered the mini plastic dinosaurs to go in eggs last year! Fun surprise to see pop out of eggs and they are atill playing with them now! Any cheap party supply has them in bulk and most fit in the eggs. I do a clue in the eggs to find the Easter basket but I also put money with the clue. Be aware “Unreal Candy” uses blue agave as a sweetener. There are cute Peter Rabbit Organic fruit purÃ©es that my kids received in their baskets! They love the sweet potato/corn/apple ones! And they even have a cute bunny on the label! Plus we put loose change in some Easter eggs plus art supplies and books! By the way was so excited, I didn’t buy one candy for Easter. The kids still loved it. Instead I did the summer theme and got them some puzzles those metal links that you’re supposed to take a part. I put money in the eggs, water balloons, stickers, and also some coupons I made; like skip a chore, oh ok I did do 1 sugar splurge and that was a Virgil’s root beer coupon but they do use real sugar. Thanks for your ideas! I am doing Legos, but instead of the little guys, I’m going to color-code the eggs for each of my two boys, and take apart a different set. When they get all of their eggs, they can make the complete set. Also, special polished stones/crystals. My 2 older kiddos are getting Magformer tiles in their baskets this year, and the baby is getting Duplo farm animals. I love to use coins! They are sugar free and you can spend less, using coins, instead of buying candy. I just love these ideas. It’s so easy for me to just pick out candy, and not put as much thought into something healthier and actually something my daughter would like better. Thank you! I have 4 teenager boys. And one 9 yo daughter. While some of these suggestions might pass w/my daughter, no way my teenager boys want bubbles & sidewalk chalk. My boys are getting new tackle boxes and fishing gear.